Snotty, fast, fun punk rock coming from Worcester, MA. The music can be compared to NOFX or The Descendents with a sprinkling of Screeching Weasel. 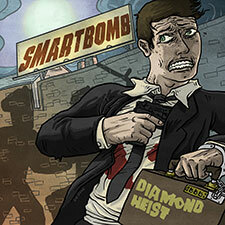 Every now and then an album arrives that pushes every single right button – Smartbomb’s debut album “Diamond Heist” is that album …on par with seminal records like Strike Anywhere’s “Change Is A Sound”, A Wilhelm Scream’s “Career Suicide”, Pennywise’s “About Time” or Lifetime’s “Hello Bastards”. 2. Who’s The Terrorist Now?